We submitted our entry materials for the NESEA Zero Net Energy Building Award yesterday. We didn’t quite have a full year’s worth of data for last year’s competition. So we were excited to apply this year. You can find out more about the requirements for the competition on the NESEA site. In putting together the data for the competition, I realized I needed to update a few items on our About page. First, square footage. We had listed the house as 1408 sf. This is the outside dimension of the house (32*22) times two floors. Technically we should include the basement, which would bring the total to 2,112 sf. Total conditioned space remains the same at 1,200 sf. That $142/sf does not include significant site work. We didn’t pick a nice easy flat site next to the road to build our house. But if you built this house to similar specs on a nice flat lot near the road and didn’t have to drill your own well or install your own leach field, then this about what what you would pay if you did a lot of the design and labor yourself. One last thing. The submission requirements included calculating the Energy Use Intensity (EUI). This is measured in kBTU per square foot per year. The fun part is converting kWh to kBTU. This is problematic for an Air Source Heat Pump, because the kWh required to create BTUs increase as the temperatures decrease. But as a general measure I suppose this is helpful. It might also be a trick question to check if the person submitting the entry knows what they are doing. Hmmm, hope I answered correctly. Here’s how I determined our EUI. Our total energy use for the last 12 months was 6,898 kWh. To convert to BTUs we multiply kWh by 3412.14163312794 BTUs which gives us 23,536,952.9853165 BTUs. Divided by 1,000 to get kBTUs is 23,537 kBTUs. Now divide by square footage. It doesn’t specify whether this is conditioned space or total enclosed space, so I chose conditioned space. That gives us an EUI value of 19.6. If we use the larger enclosed space value then we get 11.1. The lower the value the better. Maybe I should have used the 11.1 value. The winners are announced at the BuildingEnergy Conference in March. Wish us luck! P.S. 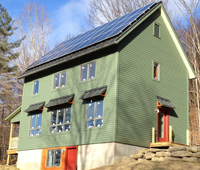 If you have built a net zero house in the larger New England area and have a year’s worth of energy data to prove you’re net zero, then apply soon. The deadline is December 15. Good luck!